A good painting job requires practice, precision, and patience, and because it's so time-intensive, many homeowners are looking to outsource the painting of their homes, both inside and out, to a professional painter. If you enjoy painting and do it well, you are in a great position to start a painting business that has the potential to be very profitable. It's easy to get started, especially as a part-time business. You have the potential to make a good income once your business is established. It allows you to have fun and be creative. 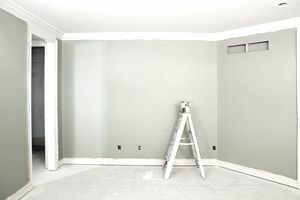 You can specialize by providing services such as faux painting, special finishes, and historically authentic painting. You can offer related services such as wallpapering for added income. You can target homeowners, builders, landlords or interior designers. It's very physical work, so you must be in good health. You may face stiff competition. Some of your work may be seasonal. You have to paint exceptionally well; it's also a good idea to offer some kind of specialty service to differentiate yourself. Your work can fluctuate with the health of the economy. You need a thorough knowledge of paints, primers, cleaning solutions, etc. You need basic painting tools and equipment such as ladders, rollers, brushes, sprayers, etc. You may need a business license, insurance, and bonding. What Are the Pros and Cons of Starting a Party-Planning Business? What Are the Pros and Cons of Starting a Computer Training Business?